“It took all of us to form a chain of survival that has resulted in a lost Peregrine recovering in a clinic with a pinned broken humerus and gaining weight; while we – the human species – looked forward to its hoped-for release in a few months time. During the time between its rescue and its release I have learned some interesting facts about Peregrine falcons. First, the nomenclature: in an earlier era they were known as Duck hawks (their primary food is other birds, especially waterfowl), or sometimes called Ledge hawks (their natural nesting sites are high craggy ledges). The genus species name, Falco peregrinus, is also enlightening. Falco is related to the Latin word, meaning sickle, referring to the sharp arc of the bird’s wing shape, and peregrine means wanderer or traveler. Some subspecies have exceptionally long migration routes; for instance Falco peregrinus tundrius breeds in the North American arctic and Greenland, and winters in Central and South America. Peregrine falcons, for centuries, have been favored hunting birds used by falconers. However, because of their inaccessible nesting sites, the birds could only be acquired during their peregrinations away from the breeding grounds, and thus became known as Peregrine falcons. Most sources identify nineteen subspecies of Peregrine falcon worldwide, three of which are in North America: Falco peregrinus tundrius (Arctic Peregrine falcon) of the Arctic tundra and Greenland; F. p. pealei, (Peale falcon) of the Pacific northwest; and F. p. anatum, (American Peregrine falcon i.e. Duck hawk), which is found throughout Canada and the United States. Falco peregrinus tundrius is of special interest to us here on Block Island. Smaller and lighter in color than the continental Peregrine falcon (F.p. anatum), this subspecies is easily identified by its obvious white forehead and large white ear patches – this is the subspecies of the traveling Peregrine falcon that was rescued this fall (see photo). The decline and recovery of American Peregrine falcon populations is well documented. What is a little less clear, are the numbers of nesting Peregrines and traveling (migrating) Peregrines prior to the precipitous decline starting in the 1940s. In the discussion of the range and distribution of Duck hawks, Edward Howe Forbush suggests, in his Birds of Massachusetts and Other New England States (1927), that there was not a definitive accounting of the presence of Peregrines in New England, largely because their nesting habitats are relatively inaccessible and had not been widely explored. Forbush reports that in all six New England states Peregrines: are “rare local summer residents”, breed in the mountain ranges of states where they exist, and are rare or uncommon migrants, “chiefly coastwise”. Forbush had a cadre of informants that corresponded with him and contributed information about bird species throughout New England. The discussion of Duck hawk distribution in Rhode Island relies almost exclusively on Elizabeth Dickens. “Rhode Island: Rare migrant, chiefly coastwise; ‘very common both spring and fall, 46 in fall of 1917’ (Miss E. Dickens), Block Island.” (Forbush, 1927). How lucky we are to have the Island as the epicenter of Elizabeth Dickens’ fifty-plus years of bird observations. And luckier still, to find that she has been followed by a long line of dedicated birders and recorders of observations. The newest example is the Biodiversity Research Institute (BRI) team of raptor banders. This group has set up a fall raptor banding station less than a mile from Elizabeth Dickens’ house, and has been banding, and in some cases attaching transmitters to, raptors since 2012. One hundred years after Elizabeth Dickens started collecting daily bird observations (E. Dickens journals start in 1912 and end in 1963), the BRI team is collecting information in a completely different historical context, but the landscape of the southwest corner of the island has changed only slightly. The BRI effort to collect information about passing raptors is more proactive than that of a single woman going about her daily 20th century farm life, making notations of what comes her way. However, I find that I cannot resist presenting some of the numbers of these raptor observations, separated by nearly a century, if for no other reason than to honor the work of both BRI and Elizabeth Dickens. The recorded observations of each, adds to the value of the other’s. These numbers represent raw data only. Elizabeth Dickens (ED) numbers are the sum of these species recorded in her journals in 1916 and 1917 for the months of September and October. The Biodiversity Research Institute (BRI) numbers represent the number of these species banded in 2012-15 during September and October. BRI numbers do not include individuals of the species that may have been seen, but not banded. In the October 17, 2015 Block Island Times I wrote in our column, Ocean Views, a story about an injured Peregrine falcon found on Block Island. Following is the edited text of that article; at the end you will see the updates on its progress. On October 5th I received three different phone calls/messages about an injured ‘hawk’. The first call from Norris Pike, - which I could not take because I was in the bank - described a large hawk on the porch of a house that he is building on the west side. The second call, from Donn Frageau, asked if there was anything I could do? I retrieved the third message at home later that evening from Steve Miller, he was also casting about for advice and care for the ‘hawk’. When speaking with Donn, (approx. 3:15 p.m.), about the ‘hawk’, which he described as sitting on the lawn not moving around much but very attentive, I explained that I was temporarily without transportation and that I would get there as soon as I could, but perhaps not until after 5pm, (when my sister Kerri Gaffett who was using my truck would be leaving on the boat). As it happened Kerri was free a bit earlier so we headed to the Rodman’s Hollow area to see about the bird. When we got to the house we found Donn working in the back, and together the three of us scouted all around the house in search of the bird, which had of course chosen that moment to disappear. Where had it gone? Donn insisted that it was in no shape to go far, but we couldn’t seem to find it. We gave up looking after a bit – I had to get Kerri to the boat – with exchanges of “call me if it shows up again”. In the time that it took me to turn around the truck and start heading out the drive, Donn was hailing us to stop. The bird had materialized and was standing, a little droop-winged, on a small pile of dirt. We approached slowly and cautiously. I kept the birds attention on me from the front, and from the back Donn quickly and deftly put a work shirt over the bird’s head and body. With essentially no struggle we had the bird – a Peregrine falcon. Now what? Once in hand, and with talons controlled, I could tell the bird was weak, but there were no obvious dramatic wounds. Two options presented themselves: Kerri could take the bird to a wildlife rehab center on the mainland, or we could see if the field biologists at the raptor station at Lewis Farm could assist, and perhaps they would have some direct connections for rehabilitation. At just after 4pm, with Kerri driving, and me holding the bird, we were headed down Lewis Farm Road trying to explain to Al Hinde (raptor specialist at the field station) that we are coming with an injured peregrine. When we pulled off the road onto the edge of the field Al met us and I handed him the bird – he was the professional on the scene. In less than half a minute he had assessed the bird: immature, male, emaciated. As we three discussed what needed to be done, what could be done, when and how, we fleshed out a plan. Al climbed the hillside to get cell reception and confirmed that one of the raptor station field biologist, Deneb Sandack, was leaving the island on the 5pm boat, and could transport the peregrine to Tufts Veterinary clinic … if we could get the bird to her, as she was already loading her car onto the boat. No problem, it was only 4:35pm. Al tucked the falcon into a Bostich box that I had procured from Donn Frageau, and off we went, headed for the boat, while Kerri applied a few reinforcing pieces of duct tape (always at the ready in my truck) to key spots on the box. Once at the dock, I parked as close as possible to the boat, Kerri with her dog and backpack went running to get a ticket, and I walked to the boat gateway where I handed off the precious cargo to her as she got on board. The boat tooted its departing horn before I got back to the truck, and I knew that at that point Kerri was looking to meet the next carrier. Later that night I heard from Deneb Sandack (who originally was headed to Cape Cod) that she had successfully delivered the peregrine to Tufts Veterinary School outside of Boston, and in spite of its very light weight and weakened condition the bird was living and had a chance at survival. During the period October 4 – 8, BRI held a retreat on Block Island for photographers, artists and writers practicing the much needed art of creating a scientifically literate public, by bridging the gap between science data and human understanding. During the retreat’s welcome dinner and keynote discussion a participant asked the island residents that were present, ‘when we post all these beautiful photographs and artistic expressions on our various websites, blogs, Facebook pages, etc. what message do you want us to be conveying to the mainland world’? My answer was that the continued existence of the Island’s beauty and its function as refuge for birds, and plants, and insects, fish, and etc., has been maintained because many people care (and have cared) enough to take protective action, and have respected the needs and lives of burying beetles, meadow voles and peregrines, as well as humans, in this island oasis. The message should be: treat this place with care and respect. It was a sense of responsibility to offer care and respect for the bird’s, as well as our own, well-being that might have saved that little Peregrine’s life. And, it took a village. No one of us could have done it on our own: not Tufts, not BRI, not Norris, not Donn, not Kerri or Deneb or me. It took all of us to form a chain of survival that has resulted in a lost Peregrine recovering in a clinic with a pinned broken humerus and gaining weight; while we – the human species – look forward to its release in a few months time. 10/5/15 - Delivered to Tufts Veterinary Clinic so weak and underweight (300g+/-) that it was a surprise that it was still living, given all the stress. Hand fed "paste" food, and too weak for immediate X-ray . 10/7/15 X-ray shows broken humorous. Feeding better and surgery to apply pins is delayed a day until the bird is stronger. 10/20 – "Doing really well," putting on weight, eating daily, except when he’s been hand held to replace/reaffix bandage for humerus fracture, which he keeps picking at (typical for a Peregrine). "Being a bit of a brat" – typical, and a good sign. Eating mice. 11/5/15 – Doing well. Xray shows the fracture to be healing well. Still gaining weight. 11/16/15 – Doing “really well”, his pins have been removed, he is now in the large flight barn and flying around. Needs to build up muscle strength and stamina. 11/30/15 – "He is in excellent body condition". Was “banded last week” by Tom French with Massachusetts Fish & Wildlife. Will probably be released later this week. 12/3/15 – Released at 7:23 a.m. at Ellisville Harbor State Park in Plymouth, MA. Every day is filled with natural history marvels, but some days, one wonder just follows another. With the help of Dave Milner and the BI Power Co., we banded this year's two osprey chicks. The young were well feathered and are obviously (based on the smell left on my hands) feeding well on fish brought to the nest by the male parent. Soon these two youngsters will be seen teetering on the edge of the nest platform flapping their wings and strengthening their muscles in preparation for that all important first flight, and - the more important - first landing, back on the nest. We can expect to see these birds through August, learning to fly and to feed themselves, before they start their dangerous first migration south, perhaps well into the Carribbean or South America. Thanks to Dave Milner, shown here, Kim Gaffett was able to band this year's 2 osprey chicks. With ospreys banded, OVF EcoWorker, Elsie Drummond, and I reconvened later in the morning for Art & Nature, where the day's live model was a painted turtle. The turtle on-hand was found as she moved away from a wetland in search of a sandy spot where she could lay her eggs. The ventral shell of the turtle below measured 14 centimeters, which put her at over 25 years old. It must have been a day for turtles. When I went to my garden I found the telltale hole of a recently dug nest of a snapping turtle. (Alas, I did not see a spotted turtle, which would be the last of the three species of turtles found on Block Island. Evidence of a recently laid nest of snapping turtle eggs, right in the path to my garden. And, why was I headed to the garden? I was on a mission to apply some natural pesticides - in the form of at least a hundred praying mantid young, which had just emerged from their overwintering ootheca (egg case). If you are lucky in the fall you can find an ootheca, which is often placed on the stems of grasses or other vegetative stems - look carefully along the edge of a field after a late season mowing. However, this ootheca had just been presented to, and received, by me days earlier, by a friend offering a house gift - in the same way that a visiting guest would offer a bottle of wine. Hundreds of praying mantids shown here having just emerged from the ootheca. I placed the small plastic container, with the natural insect pest-eaters in the corner of the garden. Baby mantids on the edge of the container. Not every day is so full with such rich encounters with nature's other beings, but these amazing examples of the continuation of life cycles are going on all around us, everyday. So, keep your eyes open and spend at least part of each day moving at a snail's - or walker's - pace. Eastern spring beauty (Claytonia virginica, a.k.a. Virginia spring beauty, or simply, spring beauty) is a delicate little plant. At no more than eight inches tall with half-inch flowers, this five-petaled, white and highlighted pink flower is truly a beauty. This little posy was discovered on Block Island on May 3, 2015. While checking mist nets for bird banding, a visiting friend, Kira Stillwell (program administrator for the RI Natural History Survey (RINHS),) noticed and asked me about a small white flower that we were passing. What I looked at, I had passed many times this season, but what she saw, was a plant that she didn’t recognize. On hands and knees we tried to identify the little plant. When we could not, we plucked a single stem to ask RINHS botanist, Hope Leeson, for help quenching our curiosity. Little did we know that we had come upon a native perennial flower that had not been reported seen in Rhode Island since 1846! The lesson is that, at least in the realm of natural history, observation is more than the act of looking. When engaged in observation, one must look with curiosity and a desire to understand, so as to see what is actually being viewed. This local rediscovery of spring beauty has caused a bit of a splash in RI with discussion about when and where it was last seen. Much to the delight of the RINHS staff, the announcement of a spring beauty sighting has spawned other reports of spring beauty occurrences around the state. In 1998, RINHS published Vascular Flora of Rhode Island: A list of Native and Naturalized Plants. In that tome, spring beauty is listed with the following comments: “Historical (native species known to have been extirpated in RI)” and, “Status undetermined: needs more study.” A primary objective of RINHS is to act as surveying agent and present/not-present information repository of all things natural history. Thus, the observation of this little plant on Block Island, combined with RINHS’s role as disseminator/catalyst, is resulting in the “seeing", and the acquisition of more information about this species throughout RI. Spring beauty is not simply beautiful, it has served its observers well over the centuries. It is a member of the purslane family and is known to be quite delicious. The vegetative parts of the plant are edible, but it is the tuber from which it grows perennially that is most often commented upon as being tasty and a source of nutrition for the early American colonists. Perhaps that is the origin of its nickname - fairy spud. Of course, seeds are produced, and the plant can be both perpetuated from the tuber, and seeded anew by the plant. Two tiny black seeds are produced from each flower and will drop to the earth where they may reseed in place or be carried away by insects. Deer, too, will eat the plant and may help to establish it in new locations. But this all begs the question: how did this tiny colony of about three to five plants happen to pop up on Block Island? I must assume that either birds or humans tracked it to the Island. Or perhaps the seeds of the fairy spud winged their way here on south or northwesterly breezes. In any case, I wonder how many times this year, or in previous years, I have looked at this plant and not "seen" it for what it is - a rare and precious beauty of the spring. Some might be repelled when, turning over a piece of wood that has lain on the ground all winter, they find that their fingers have oozed into something slimy and gelatinous. You can tell that you are a naturalist when your “euhewwww” reaction is instantly shifted to a “what is that” reaction, and then you start peering closely and poking into the material. That was my reaction one day early this spring when I found that the underside of a small piece of firewood was covered in what looked like amber Jell-O and a layer of fuzzy mold filaments. I don’t think that I had ever actually seen a jelly fungus before, but I was fairly certain that I was seeing it then. We live in an age of very helpful technology: I took many digital photographs and then turned to the internet. I have yet to get my hands on a fungus field guide or expert in this group, but what I appeared to have turned over was a colony of jelly fungus from the genus Tremella. Fungi from this genus are parasitic on species of wood-decaying fungi and are thus found in combination with other fungi. They appear on hard woods (such as the choke cherry log in question) that are in early states of decomposition on the ground. One of the most unusual spring flower forms can be found in Skunk Cabbage. This northern hemisphere native plant starts poking its spathe (sheath) out of snow or frozen ground earlier than most other plants because it produces heat as it begins to grow. Often the air temperature trapped within the spathe can be up to 20 degrees warmer than the outside air temperature. In its own bizarre way this is truly a beautiful flowering plant with a specialized form. During the course of the early spring, the leaves will grow into quite large leafy fronds ultimately dwarfing the flower. The name comes from the skunk-like odor that emanates from the plant especially when the leaves are crushed. On Block Island, I only know one location where skunk cabbage flourishes in spring. The white eye of the White-eyed vireo gives this bird a demented look. But its unusual eye color makes this bird an easy one to identify. This species of vireo nests on Block Island, and its winter migration may take it as far south as Nicaragua. This photo shows the contents of an owl pellet (most likely a barn owl's). This gorgeous, but macabre, set of skulls, bones and fur is the contents of an owl pellet found along a trail at Clay Head. Thinking that the small grey object was a wad of dried mud and desiccated deer poop, I kicked the pellet aside. But with the force of that little kick the wad crumbled open, revealing at least 2 rat skulls, a lower jaw unit, leg bones, many ribs, at lease one scapula, and lots of matted fur. Owls eat their prey whole, but cannot digest fur, feathers or bone, so they have developed a neat trick of concentrating the indigestible material into a pellet, which they then expell by regurgitation. In this photograph, half of the woodcock's bill is hidden behind the woody trunk. A lovable-looking little bird, the American woodcock also has features that make it look a little odd. It spends much if its time camouflaged in fields, woody fens, and tucked into the underbrush probing the ground with its long pliable bill for grubs and worms. Its large dark eyes are positioned near the back of the head, giving it more rear directed peripheral vision to help avoid predators while its head is facing downward. Ten year old Black-capped chickadee - an old friend. Black-capped chickadees are common resident birds on Block Island that can be seen year-round. When I get them in my mist nets, I prepare to deal with their tenacious behavior, as they pinch and peck away at my cuticles with ferocity. They can be a “pain” to deal with, and the reward of banding such a common bird can be limited. If beauty is in the eye of the beholder, it can also be a matter of perspective. The scraggily Black-capped chickadee shown above was particularly relentless in her attack on my fingers, but her longevity was stunning. This bird was banded in 2006 as a Hatching Year bird (its first year of life), and has been recaptured in the nets 12 times in the last 10 years. In 2011, it was discovered to have a brood patch (bare spot on her breast to facilitate incubation of eggs) ah-ha a female. In successive years, it appeared twice to have an egg in its cloaca (vent) and was obviously ready to lay an egg. In a world where the average life expectancy of a small bird is 3 – 5 years, this ten-year-old bird had transitioned in my mind’s eye from mundane to radiant. During the first half of the current lunar cycle, spring sleepily began. This period began with a new moon on March 20 – also the day of the vernal equinox – and continued to the full moon of April 4. In many – maybe most – cultures moon cycles are named. Sometimes it is the new moon that is named (members of the Iroquois Confederacy,) but we are more familiar with the naming of the full moons. Depending on the culture, or the era, a variety of moon names have been used. For instance, April’s moon might be known as the full planters, egg, seed, or wildcat moon. This year, the neo-Pagan, full Awakening Moon, seems most apt. Lunar cycles, marked by the naming of a moon, and seasonal holidays are related to the happenings of the season. Maine’s northeast Abenaki people call April’s full moon the Sugar Maker Moon; and, members of the Cherokee Nation held its First New Moon of Spring festival in March to celebrate the resurgence of growth and community. And, so too, the Christian celebration of Easter, which occurs on the first Sunday, after the first full moon, after the spring equinox, is at its core related to the newness and restarting of a season and a new year of growth. Like a teenager – who when the morning window brightens, turns over and tucks their head under the covers – spring has been slow to emerge and awaken from under earth’s blanket of snow. During the past two weeks of this lunar cycle, evidence of winter – such as the March 27 snow that layered the island under a couple of inches of light batting, and the several sightings of a snowy owl over the weekend of April 3rd – continued. However, in that same period leading up to the full Awakening Moon, signs of spring were also evident. Around March 25th the second of the Osprey pair arrived and are now actively attending to the nest platform at the BI Power Co. A tentative chorusing of spring peepers was noted on April 1st. And, of course, the spring migration of birds results in a great overlap of “winter” and “summer” species on the Island. For instance a flock of twelve – fifteen Snow geese have been reported from “the plains” and are headed to the Arctic grasslands; while Tree swallows have arrived in a swirl for their summer nesting, from perhaps as far away as central America. The sounds of the seasons were also overlapping in late March. The low booming echo of winter’s pond-ice cracking, (because warming temperatures cause the ice to expand) is a wonderful soundscape on a sunny morning, when simultaneously, the season ushers in the summer players of Eastern phoebe, American woodcock, and American egret. All of these multi-sensed observations have been noted and recorded around the island between the last new moon of winter and the first full moon of spring – the first half of the lunar cycle of the Full Awakening Moon. Who knows what will come your way if you are observant during the last half of the season of the Awakening Moon. Perhaps you’ll observe the: vibrancy of lichens, unusualness of skunk cabbage, appearance of eels, or the rare flitting of Blue-gray gnatcatchers or Bluebirds? 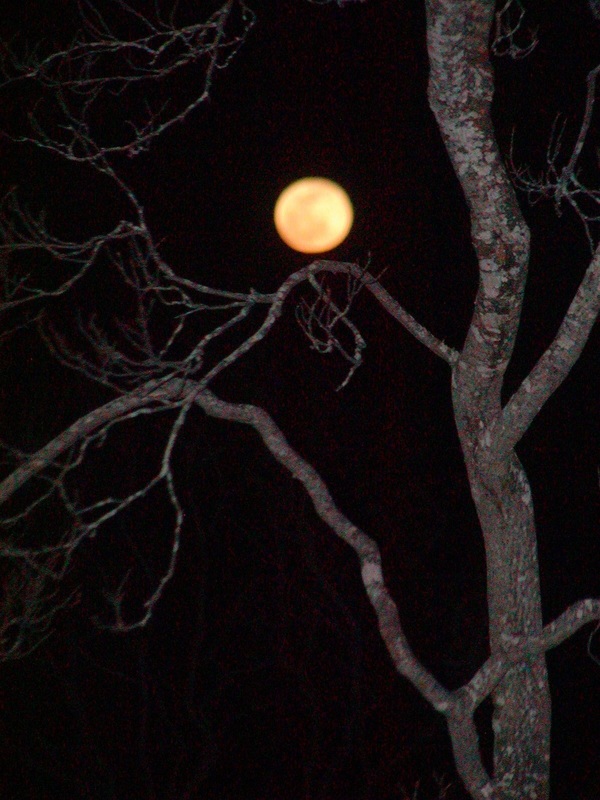 April 4, 2015: Full Awakening Moon as seen from yard alongside Mill Tail Swamp Pond, Block Island, RI. What do Block Island, Iceland, Providence, and Wiscasset, Maine all have in common? * Well actually, throw in the whole earth to that question and the answer becomes both easier and more difficult: Climate Change. Rising sea level and melting glaciers are huge and complicated problems, but like any giant tasks, they are best considered, and reacted to, with small discrete actions. If we accept that we live in a world where everything is connected, then we must accept/believe that our actions - even small ones - have an affect on everything - even giant things...including climate change. In the last 2 weeks I've attended 2 workshops about how we, as environmental educators, can work to make the fact of climate change more understandable, less debilitating, and, (to use the jargon) to make us, and our communities, more resilient to the effects of climate change in our surroundings. The first workshop (March 12) was in Providence, RI sponsored by the Metcalf Institute. It focused on "how to translate scientific data to engage your audiences" , in other words we were encouraged to use the power of story (personal, reporting, historic) and acknowledge our changing environment while promoting alternative actions that are healthier for individuals, communities and the earth. Included in the discussion was how alternative ways of presenting data (think art, sound, social media, etc.) can reach people in ways that may be more effective for fostering understanding, and in turn changes in behavior. The second conference (March 20) was in Wiscasset, ME at Chewonki, and was sponsored by the Maine Environmental Education Association. At this gathering my focus was "Climate change: communities taking their knowledge to action." Here I was inspired by the role of citizen science as a tool to educate, and develop participation that can both produce important data and encourage behavior changes - even small ones. Included were great suggestions for on-line tools that can be used to assist and support such projects, as well as great examples of actual community involvement programs and projects. Obviously, I've just touched on the "tip of the iceberg" of fun and useful things that I've been able to learn about, and been able to discuss with others of like mind. Now for the field work... stay tuned. Meeting hall at Chewonki: group discussion with a whale looking over our shoulders. The sign at this primo parking spot reads "reserved for electric vehicle charging". Hmmm, food for thought. *Alternate answer to opening sentence questions: places that I have been lucky enough to be in during the last month. 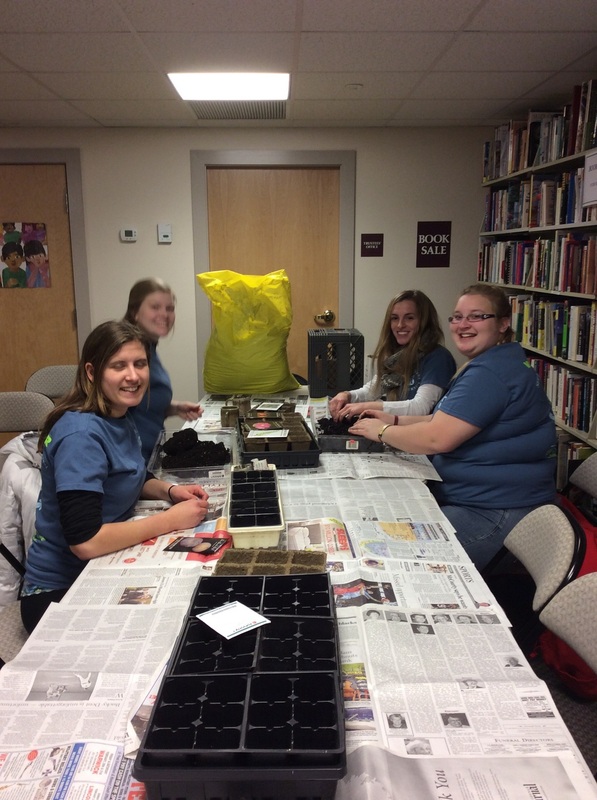 With the help of Salve Regina students, this year's butterfly weed seeds have been started. (Really, spring is coming, I promise.) The students were on Block Island doing various volunteer projects, for the Block Island School, St. Andrews, BI Early Learning Center, Island Free Library, and Ocean View Fountation, as part of their "Stay Break" (in lieu of Spring Break) activities. Many thanks to these helpful and enthusiastic students. Four of the fourteen students who helped shovel ice from the parking lot, tutored in the use of electronic devises and digital media, shelved books, and started seeds. What a beautiful snowy day. A rarity for the Island, the snow fell all day with little wind, so the snow just kept piling up - at least 8 inches, and still sifting down. 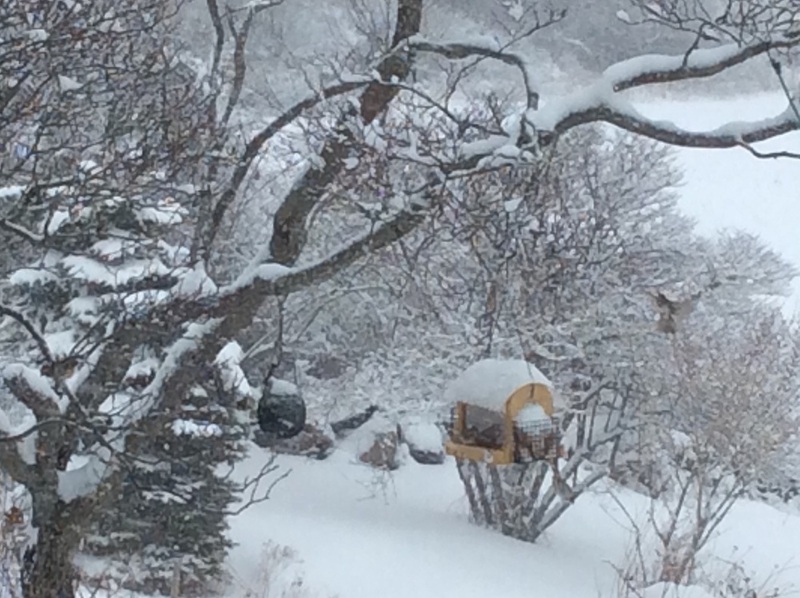 As I reached for my binoculars, so that I could get a magnified view of the beauties, and then turned back to the scene, I realized that I have an equal opportunity bird feeder. In those few seconds the little feathered sprites - as if it were a magic trick - were replaced by a large sharp-shinned hawk with a tuft of feathers in one taloned foot. It paused for a moment, (less time than it took me to replace my binoculars with the camera) and then flew off with a couple of slow wing flaps and its feathery quarry firmly grasped. It took a little while before the feeder area refilled with activity, but it did. Soon enough, amongst the gently falling snow and dimmed afternoon light, the birds were again flitting in a frenzy of feeding activity - save one. I could not tell which bird fell prey to the hawk, but I can say that throughout the afternoon, I did not see again the fox sparrow. Can you see 11 birds in this picture? Where is the Downy woodpecker? For most of the group this is a travel day home/beyond, but for three of us (Kathy & Kay & me) we share a taxi and move to down town Reykjavik hotels. By the time I reached the end of the cemetery I was nearly at my destination: the National Museum of Iceland. A welcoming institution. The primary exhibit, The Birth of a Nation, spans 2 large floors, starting around the year 870 and the first settler and the "settlement period" (ending around 930). The exhibit ends with the ultimate declaration of Iceland's independence from Norway in 1944, and artifacts and memorabilia from the last decades of the 20th century. Also at the end' there are oral history videos displayed (in Icelandic, of course), and booths set up for visitors to record their own Icelandic history. Among the many displays and interactive interpretive opportunities, three stand out for me. First, an audio story told as if by the son of the first letterpress printer in the country. Of course this man was initially supported by his patron - the church - who paid for his education and training in Coppenhagen for a year before returning to set the type and print Iceland's first bible and other religious documents. Eventually this printer earned his released, and went on to print more secular items. Interestingly the patron priest was ultimately murdered in the reformation from Catholism to Lutherism. Next was the room the discussed the motion of the earth, sun and moon, and space in general. On the wall hung a large white sheet of paper, with all the regions of Iceland listed. Under each region was listed various terms for the cardinal directions (north, south, east & west) used in each region - there were many. 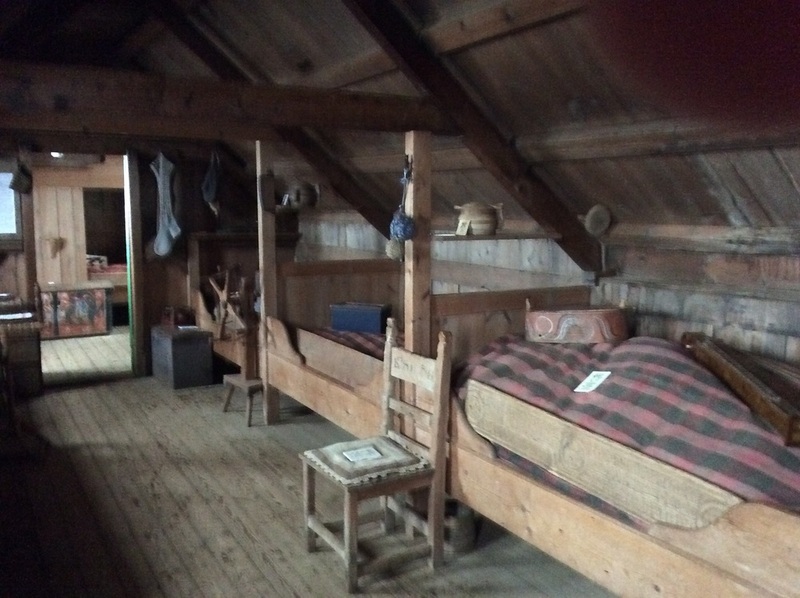 In addition pencils were provided for visitors to add other, even more colloquial, terms. Again, there were several additions. Finally, there was a special hall of photographs from all over Iceland, depicting people active in the chores and events of every day life during the 1900s. Many of the photos (from the trove of photos given to the museum over the decades) were unidentified as to place and persons. Visitors were encouraged to supply indentification when possible - apparently a very successful program. How great it must feel to be an unsuspecting visitor and discover an unknown photo of a friend, relative, or place, and thus name it for the museum. An example: an elderly man recognized his father as a young boy on a fishing dory with his grandfather. In this case, the man recognized the vessel and harbor first, and then the faces, which were reflected in his own. We woke early to light snow at sea level in Akureyri's, with a long day ahead of us, and three mountain passes to traverse before reaching Reykjavik. 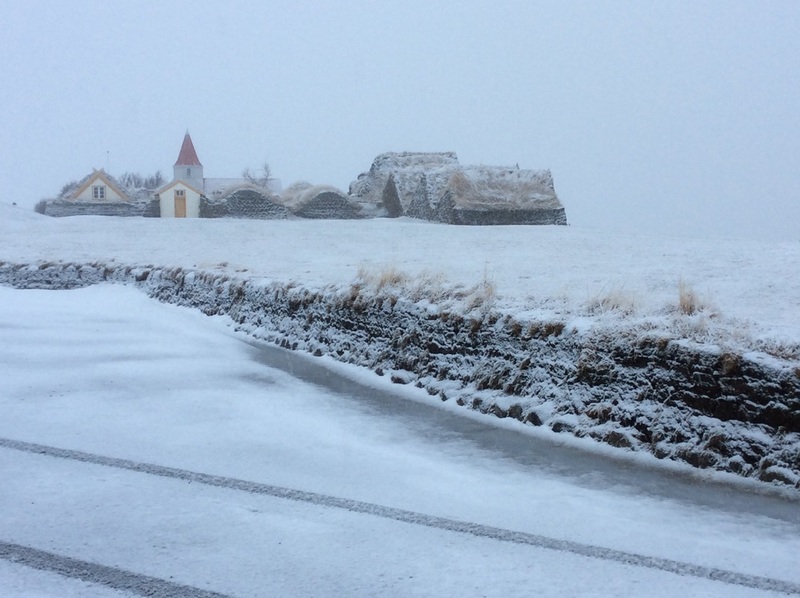 We left Akureyri at 8:30 in light wet snow, and drove west until we arrived at a folk museum and turf farm at Glaumbaer. This is an amazing structure built primarily of drift/found wood and sided and roofed with turf. This traditional building style replace long houses because they are more efficient to heat and require minimal amounts of wood for building and heating. They are SMALL and LOW - however I did not have to duck as most of our group did to get through the doors. Dear reader this is all you are getting - at the moment, as I just spent 2 hours finishing this piece - but appear to have lost it all. FRUSTRATION is putting me to bed. Leaving the Myvatn Lake region & hotel this morning was like saying good bye to a new friend, one you may never see again. It is a relatively remote area, with wide open space and a very spare landscape. The settlement area is small and our amenities were to be found in the single hotel that is open. If you can recall the Public Market, or later, the Seaside Market on Block Isand (pre 1975) then you can envision the market at Reykjahlid, the settlement where the hotel was. Leaving, today felt like the first - not entirely welcome - step back "to civilization. Mid-day had us stopping at the Christmas Shop. Apparently, a tiny gift shop decorated as Father Christmas' village, filled to the gills with Christmas items - from ornaments, to local memorabilia (Yuletide lads), to Christmas tradition imports - has no international boundaries. Early afternoon had us delivered to our hotel in Akureyri, with the afternoon "free at leisure". Akureyri is the unofficial capital of north Iceland, I.e. a city of commerce along the Eyjafjordur fiord, with an international port, and one of three international airports in Iceland. However, before leaving the Myvatn area, we visited the bird museum built in memory and honor of Fuglasafn Sigurgeir, a bird enthusiast who collected over 80 species of birds (mostly Icelandic breeding and wintering birds) before his untimely death at the age of 37 - the result of a drowning accident. I was attracted to this museum for the obvious reasons of there being birds, and because of the similarity to our own Elizabeth Dickens bird collection on BI. The setting of this beutiful little museum - on the low land adjacent to Lake Myvatn, right where Mr. Sigurgeir lived, worked, collected the birds, and where today the area continues to be one of the earth's great nesting ecosystems for waterfowl and shorebirds - was stunning in its winter repose. The habitat was peaceful and expansive, and the museum was a mini oasis of human-made warmth, Around the shoveled drifts and the buildings foundation, several snow buntings, already sporting the rusts and browns of spring plumage, were fliting among the sunny spots of shelter. Although The landscape is quiet now, the snow bunting (known in Iceland by two names- winter bird and summer squeaker) will soon be joined by tens of thousands of raucous breeding birds in the Lake Myvatn area. 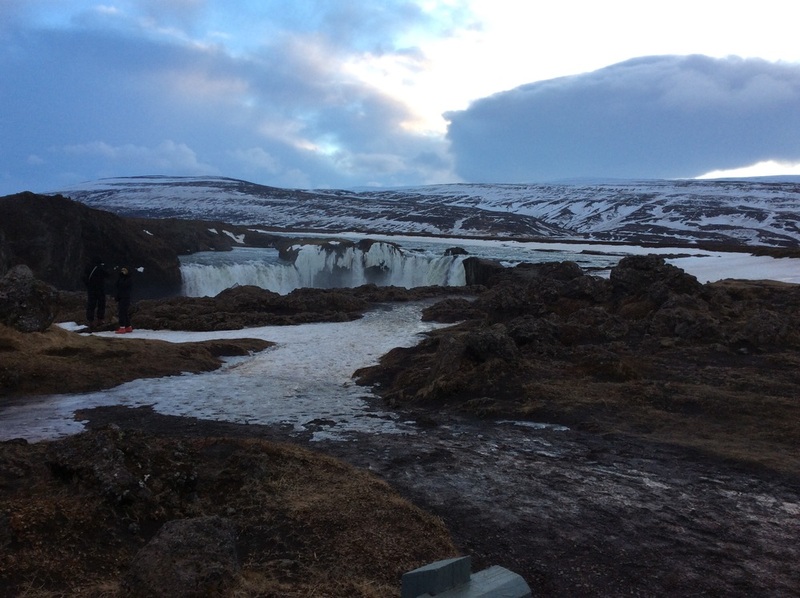 Our next stop was a repeat visit to Godafoss - waterfall of the Gods. This time we were on the opposite side of the falls. It was a sparkling day of sun and a light covering of new snow. 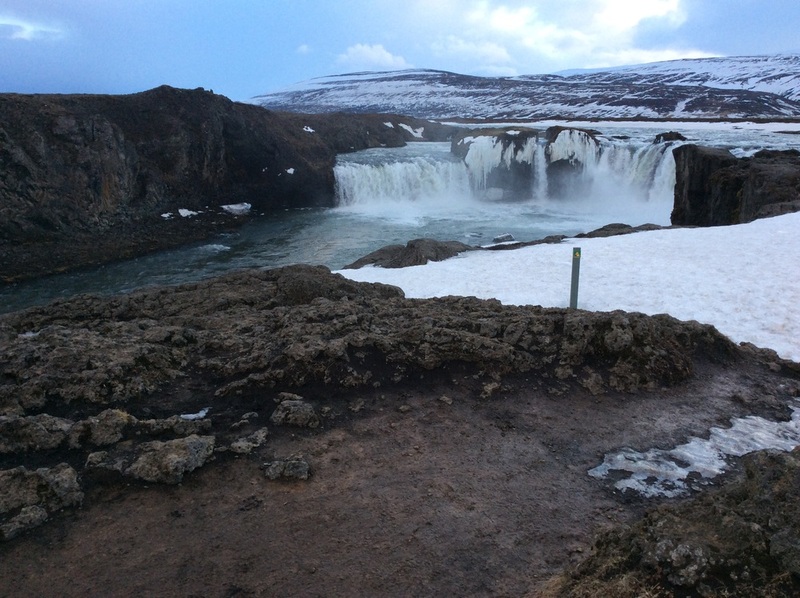 The trail to Godafoss was a wide path that curled out before us like a white velvet ribbon, the only foot prints before our's were those of an arctic fox. We arriveded in Akureyri in the afternoon, and were released to the streets to explore on our own. There were gulls along the waterfront and ravens keeping watch over me as I walked along. 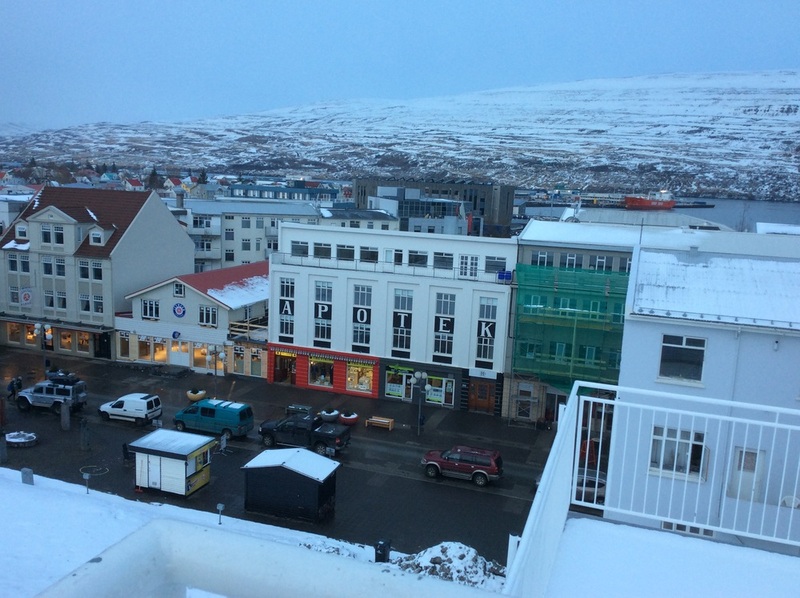 A pretty city of about 17,000 people, Akureyri's main Street rose steeply from the fiord. The best part of the city was our dinner meal. Knowing that it would our last together we all elected to dine together. We have become quite a little band, enjoying each other's company and learning about our differing backgrounds and our similarities. Again, sitting around the table long after the meal was served and eaten (By-the-way, I had guillemot, and it was delicious) we just kept talking. Not really wanting the evening to end, we took a short walk and then drove out of town looking for one more chance to see the aurora - even though we all knew that it was a fools errand, we were happy to be joined in a common venture. The day was a little less intense than the last few. It was gloriously sunny until mid- afternoon, not too windy, and a warm 20 degrees F. First, a nice walk around a small peninsula that juts into Lake Myvatn that included stunning elevated views of the lake and the standing rock formations along parts of the shore line. Also a walk through a forest of some native species (dwarf birch trees) and planted trees and other vegetation. It is interesting to note that the trees in the photo below are approximately 70 years old. Lichens and mosses are on all surfaces. Lichens are well known pioneer species, so wherever the lava substrate is covered, it is either with lichens, or once was. The trees too, often have several lichen species on them of differing shades and forms. Some are familiar: reindeer moss is lush in this habitat. 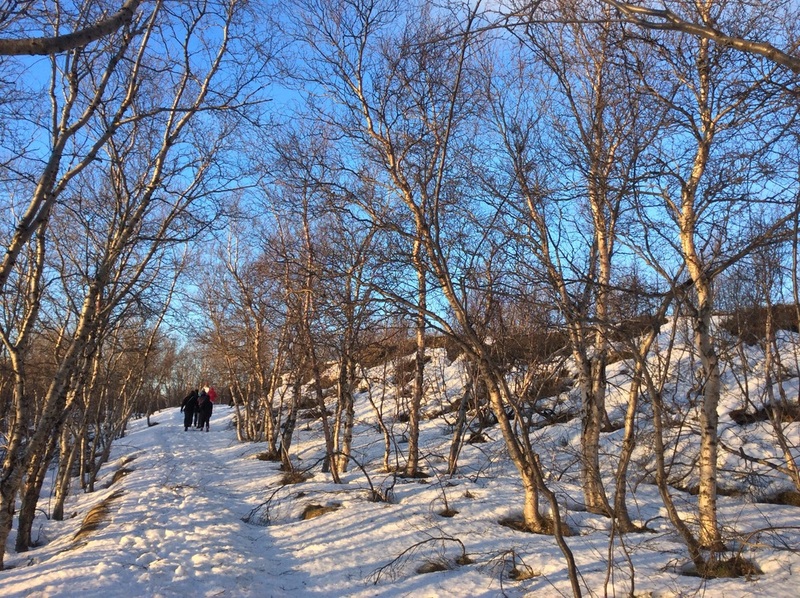 Today's favorite scene is of wending among the forest of birch trees, where our path curved along a little glade of snow. Up they flew: about 10 pure white ptarmigan with their black tails weaving through the warp of whitish-grey birches, then dividing in a cursive "Y" ahead of us. It will be a long time - I hope - before I forget the sense of steward for my covey that I felt at that moment. I am simply content to see that they were in that little forest. I did not need to capture them in any way (not with binoculars, or camera, or other,) and I pray that our presence did not disturb them long. Next we went to an area of pseudo craters, and walked up and around several of the mounds. We paused often to take-in the view and geologic explanations of these pseudo craters and Lake Myvatn, once noting the horse riders crossing the ice. At lunch we joined with all of Iceland for a traditional meal of pea soup, to which is added boiled potato, carrots, turnip, and salted lamb, on this Explosion Day - the last day of Carnavle, an Icelandic version of Fat Tuesday. 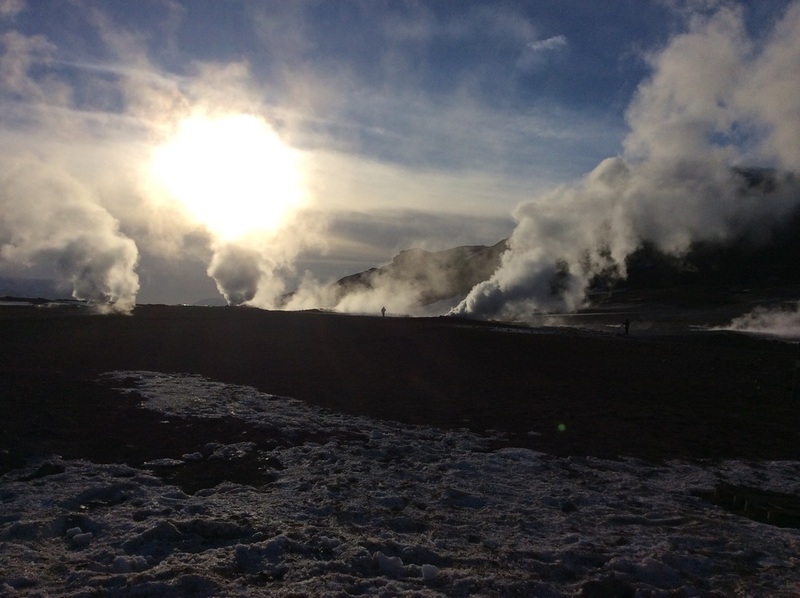 The afternoon took us to the geothermal fields of bubbling mud holes and frothy emissions of sulfur-laden steam. Ethereal to see, mesmerizing to fathom, and, for me, repulsive to smell. Give me barrels of ode-d'lobster bait any day of the week. Much more pleasant was the next stop, where a local member of the community had baked us dark rye bread (very like Boston brown bread) in a hole that she owns for such baking. The bread had been cooking for 24 hours in this geothermal "oven", and was delicious, with or without slathered butter. Across the road from her oven the steam rising from the bore holes of the geothermal power plant were also billowing out. Ninety per cent of Iceland's heat and electricity is produced with It's geothermal resource. The day ended with a remarkable visit to the Lake Myvatn visitors center. It is a wonderfully presented resource, and was tremendously enhance by Martina's discussion of Iceland geology - plate tectonics, glaciers, volcanoes and so much more. Snowing and blowing fiercely now, in spite of good aurora activity, sky and weather conditions do not allow for a view of the northern lights tonight. Peace. Today's birds: Barrow's goldeneye, whooping swans, raven, & ptarmigan. Today's adventure started with a walk along a short open-water edge of Lake Myvatn. It was a stunning landscape of a lava base, carpeted here and there with lichens, moss, ice, and patches of dwarf birch. In the open water were several pairs of Barrow's goldeneye, and a mixed family of Whooping swans (2 young, 3 adults). The afternoon included a look into a steaming fissure - "mind the gap", where the North American and Eurasian tectonic plates are separating. Then on to the Myvatn Nature Baths, where we ALL soak in aquamarine, mineral-rich, hot water originating from this volcanic zone (although cooled so as to be tolerable). Evening featured another wonderful meal, including smoked Arctic char as a starter. Then out into the night with many layers of cloths and wishful thinking. As I write this my hands are still shaking, not with cold, but rather with elation. It was an amazing display of northern lights! Tears were streaming, again, not from the cold & wind, but from joy, overwhelming gratitude, and an unbounded sense of awe. (Photos will appear in the future, for now, the Image of the aurora lives in my heart and mind.) Peace. Dimmuborgir - the dark castles. A fissure appears and spreads, releasing steam and forming grottos containg exceedingly hot water. A morning of continued high winds had us taking an alternate route - a bit longer but that was ok. Besides meeting an amazing local fellow who turned a lost fishing community around by reimagining it as a spot for a herring fisheries industrial museum we saw wonderful view of ... Lava landscape & snow, fiords and mountains. And the "waterfall of the God" - Godafoss. Loved the story behind this naming, when in the year 1000, Christianity was declared the "state" religion, relics depicting pagan gods were cast over the falls by the law speaker (head of governing parliament at the time). I wonder if this was the last peaceful religious debate within any nation. Although Christianity was declare the official religion, pagans were not prosecuted for practicing their rituals privately. This situation is not unlike current day acceptance of all religions, while the Lutheran church is acknowledged as the State religion. Also, the best explanation of plate tectonics that I have ever heard. Learned that Iceland is actually an above water extension of the mid-Atlantic Ridge, and that Iceland is growing land mass as the two tectonic plates that Iceland straddles, is separating at a rate of about 2 centimeters per year. As the only country growing Iceland may one day be the largest and most powerful country in the world - all with out a military. Peace. Ohoh my an amazing day. First, our group is 8 people. Kathy and Kay from Florida (nurses who work together, one well traveled, the other is on her first trip out of the US) From the Netherlands Malise & Jon, Leeza from Athens, Alex & Whi Minh (phonetic spelling) from Singapore, and of course, me. Our guide and driver is Martina, from Iceland, and as an Icelandic enthusiast - history, nature lover, follower of Icelandic government & environmental policy and law, jolly & reassuring in the face of "changing conditions on the ground", patient with the lot of us - she is the "Kim Gaffett-equivalent" in Iceland. i've been to a waterfall, an Icelandic forest where the dwarf Birch trees are 50 to 60 years old. Hiked up to the edge and circled the edge of a volcanic crater in snow - exilarating. We've been to a seal center where research is going on to learn more about harbor and gray seals, and visited an 184? curch made of turf and driftwood - the wood is all original and brought to the shores from the Gulf Stream current, and the current from Siberia. We did not end the day where it was planned, as the winds were too great to travel the third mountain pass. The wind was blowing 30 to 35 m/s which is roughly 67 - 75 mph. Together with icy roads and the high-profile vehicle it was determined that it was I advisable to continue, so we took an alternative and went somewhere else. Love the flexibility and spontaneity. Wind said to lessen in the morning, by 8or 9 - before sunrise. No sign of aurora/northern lights, yet, but scudding clouds, whipping winds, plunging waterfalls, black lava mountains dusted with snow, and an international communion of new friends lingering over dinner at a long table defies descriptions of beauty, awe, and appreciation. Well, I said that I wasn't going to blog on vacation...but, maybe a little. Discovery #1, if you want to learn how to use a new device, go to another country (one where you don't know the language) and only take the new device. Discovery #2, it is easier to take notes with paper &pencil then by finger-touching on an iPad mini. Conclusion: short entries. Here is the view out of my hotel room in Reykjavik. The image of lightly snow covered volcanic hills, reminded me of the stunning contrast that I recently observed on Block Island, when the wind whipped and drifted together dunes of black magnetite sand and snow. Here are Josie and Jim reviewing the kindergartner's artwork for this year's Pavilion Bag, trying to figure out, of all the great work, which one should represent the Ocean View Foundation in 2015.